This is less a Yarn Along post and more of a knitting and reading wish list. Knitting and reading have not been big parts of my life these days, especially since I’m at the tail end of twelve full work days in a row. I really do enjoy my job – but I haven’t been coming home with a lot of oomph, if you know what I mean. This weekend I will work on my brown sweater some more, finish Go Set a Watchman (which I’m enjoying, by the way – I’m a little worried that Harper Lee won’t be able to end it with the subtlety its plot and characters deserve, but I’m enjoying it nonetheless), and start The House of Mirth, which is part of the Numbers Challenge. Remember the Numbers Challenge? No? Most of the time I don’t either, but I really do want to get going on some of the books I promised myself I would read. And if the universe is kind, it will be foggy and I will be able to do all of the above in sweatpants. 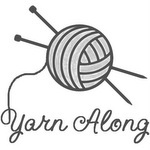 This entry was posted in Yarn Along and tagged American literature, classic literature, Edith Wharton, English rib sweater, knitting, knitting sweaters, The House of Mirth, wool, wool sweater, yarn. Bookmark the permalink. my universe is destined to NOT be kind this weekend…..reading and knitting in sweatpants. A bit of heaven…hope it comes your way. Take a break from your long days of work. 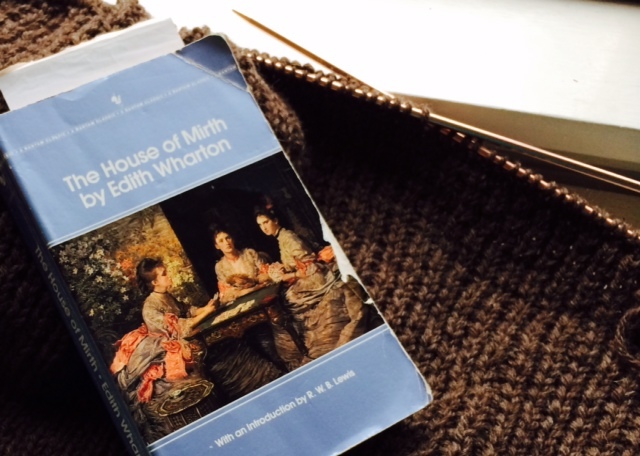 Read, knit, relax and pray for fog? Really? Enjoy. That darn work thing. It really interferes with us being able to enjoy the knitting and reading. It’s been so hot here I haven’t been real motivated to knit actually. I sympathize. When I lived in a hot climate I used to crank the a/c so I could knit. I enjoyed House of Mirth when I read it a couple years ago. I hope you are too. I’m starting from scratch because I read the first half a long time ago. But yes, it’s a good one!